Saw this last Sunday with my Panget, his brother and sis-in-law. I was told that this movie was great - that it had a lot of twist. My Panget's sister told us to listen intently - and so I did. I was quite confused on what event first transpired. It was like watching Memento all over again - there were a lot of flashbacks and it was a little confusing. The movie was going to and from the past to the present and vice versa. Maybe I expected too much.. I was quite shocked, impressed and found it funny when I saw that David Bowie was in the movie. The role fits him perfectly - but that's just me. My Panget has told me countless of times that since I started Yoga - it was all I could talk about. Well, of course! That is what I have been doing for the past weeks! I just took the 30-day challenge wherein I have to attend yoga for 30 straigt days - without fail. I've been successful and it's my 12th day today. And so far so good! I always thought that as the days progress, things will get easier - but the opposite is happening! I'm having a harder time balancing, holding my poses andmore! But at the same time, I've seen improvements in my flexibility - when before I couldn't get my forehead to the floor - now I can! Yipee!! It's such an acheivement for me! My clothes do fit better now (feeling ko lang) but I know it's too early to tell if I indeed lost weight. Here's to more of Bikram Yoga!! Cheers! In order to bring to the fore of national consciousness the religious and cultural significance of the Eid’l Fitr, the Muslim Feast of Ramadhan, Malacanang has declared Tuesday, Oct. 24, as a regular holiday nationwide. In Proclamation 1155 which Executive Secretary Eduardo Ermita signed today, President Gloria Macapagal-Arroyo cited the need to promote cultural understanding and integration. The declaration, Ermita said, would give the entire Filipino nation the full opportunity to join their Muslim brothers and sisters in the observance and celebration of Eid'l Fitr. The main date for this year’s celebration of Ramadhan has been determined to fall on Oct. 24. Republic Act No. 9177 declared Eid’l Fitr as a regular holiday throughout the country. Ramadhan is celebrated by the Muslim world for three days after the end of the month of fasting. My arms are so sore, it was like I excersized with dumbells for a long time. But nevertheless, it feels great! (Can you beleive I'm saying this?) I still could not believe I was able to do some poses! Sure, I got off balanced a couple of time - but still! I was able to do most of the poses. I had a hard time 'holding' the poses but still, I was able to do it! Concentration is key. One should not be conscious of the people around the studio, but instead - FOCUS on doing the poses correctly. I'm looking forward to another session, but this time - in a heated room. I can just imagine how many calories I'll be burning in a heated room. Yey!! I love cup cakes - they make me feel like I'm a kid again. They're so cute and fun to look at! They're simply an irristable treat for me - provided that its vanilla or butter flavored as I am not a fan of chocolates.. (I know, I'm weird - I get it..) I don't know why, but I am very much fascinated with them. I used to bake chocolate cupcakes for my brother's friends - and guessing by their reaction - they loved it! I've heard of her cupcakes but, I never got the chance to try them. 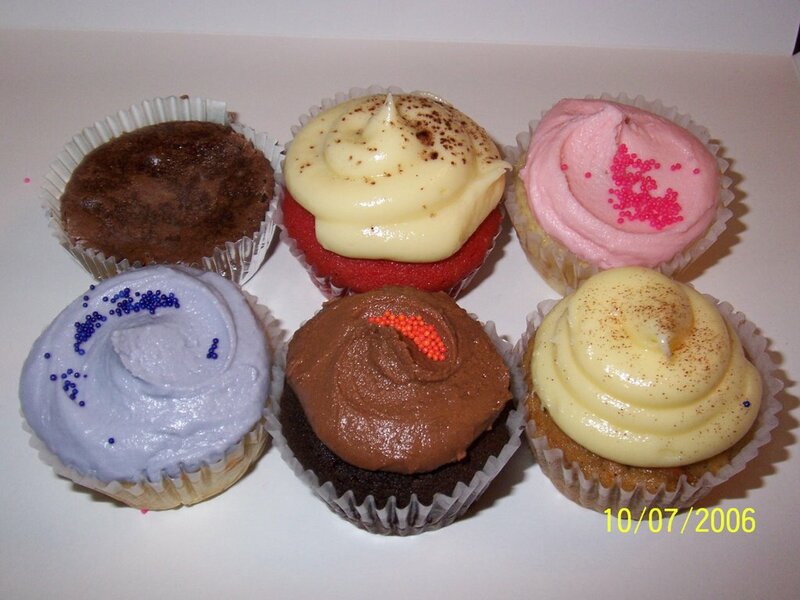 My curiousity increased more as I read entries of the cupcakes from my favorite foodie blogs Ramblings of a Gypsy Soul and Our Awesome Planet. I was quite happy to learn from Anton of Our Awesome Planet that she was opening shop soon at Serendra. 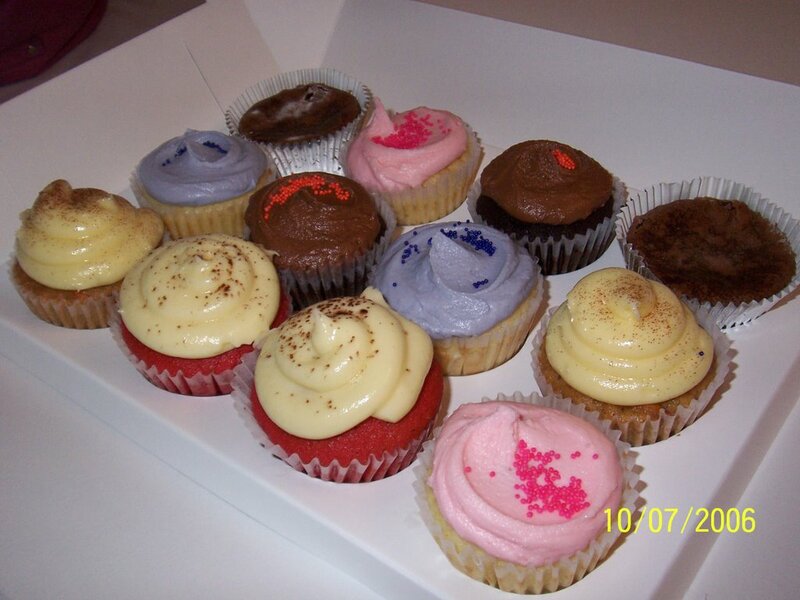 When I tried to inquire on Sonja's cupcakes - I was given an invite to the dry run of her shop. Unfortunately, it was on a weekday and I had work! It was just last Saturday that I got the chance to visit her shop and sample a few of her famous cupcakes. The facade of her shop is catchy and cute! Imagine a cute pink striped store! It looked so much like a candy store! Actually, it looks a lot like a New York-ish kind of cake store, one you'd happen to see in movies or in the Lifestyle Channel's the Food Network! Upon entering the store, I was welcomed by 3 smiley faces - unfortunately, they were still closed as they still had to bake most of their products. But since I was not in a rush, I asked if I could order ahead and have the cup cakes picked up later in the afternoon, one of the girls agreed to help me out. 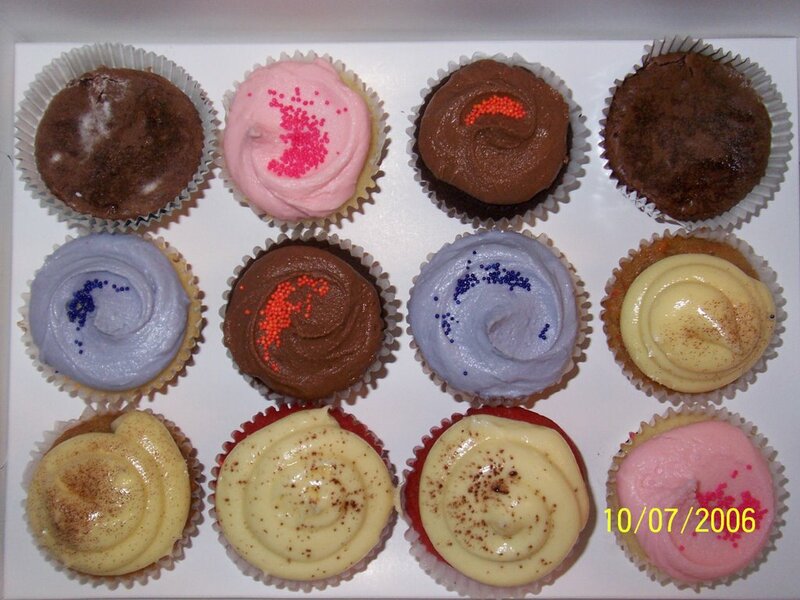 I decided to get the dozen box that consisted of a mix of Red Velvet Vixen, Vanilla Surprise, Valrhona Flourless Cupcake, Chocolate Surprise, and the Bunny Huggers. 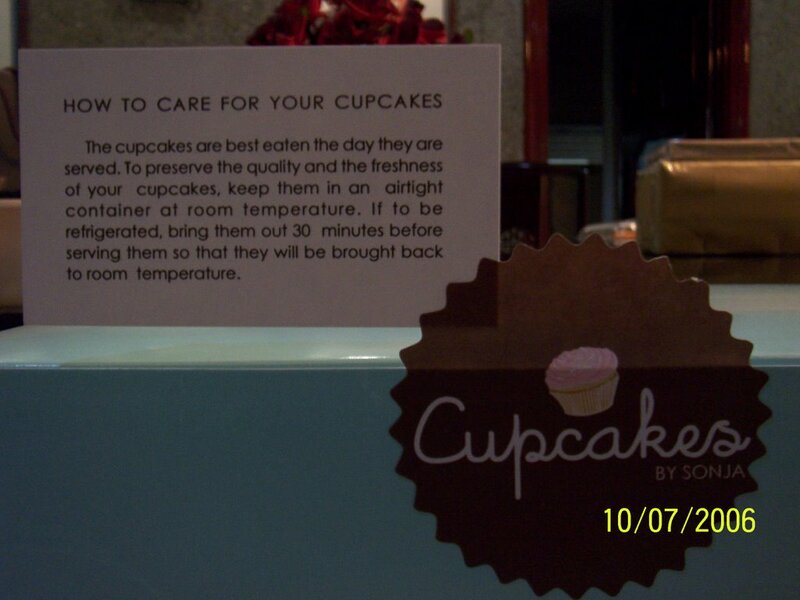 I was very excited to sample thes cupcakes - but I had to wait. After our lunch at Polu Kai, my friend Gracie and I proceeded to Sonja's shop to pick up my order. Upon entering - I was suprised that the store had so little cupcakes on display! But I was told that most of them were already sold - good thing I ordered ahead of time. Thank goodness!! Hehehe.. The verdict? I love them! I love the Vanilla Surprise and the Red Velvet Vixen! I had to contain myself and not eat them while in the car! When I got home, I took pictures first (yes, I know!) and then proceeded to try the Vanilla Suprise with the light blue frosting - I love the texture of the cup cake and the frosting was really delicious! Before going out to dinner - I just had to sample the Red Velvet Vixen. As I was not fond of chocolates (I hate them, remember?) I was dreading the taste of chocolate - good thing - I wasn't able to taste any chocolate! Yehey! I like the consistency of the redness of the cupcake and the frosting as well! The combination is really great, not only was it eye candy - it tasted heavenly! 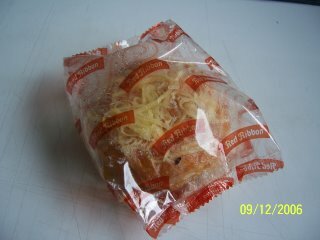 I had my Panget sample the Red Velvet and even if he had sipon (colds) he loved it! I can't wait to visit Serendra again soon!! What do Madonna, Cristy Turlington, Reese Witherspoon - have in common? YOGA - they've all practiced yoga sometime - to tone their muscles or to lose weight. Well, since I have this endless quest to lose weight - I will finally brave and try yoga for the first time next Tuesday. Next Tuesday will be the opening of the Bikram Yoga center in Quezon City. FInally! A Yoga studio near me!! I am very much excited and at the same time nervous. Nervous why? Well, the studio is kind of heated thus - I fear I might faint - but not to worry as I will get my 8 glasses of water a day, as suggested by the one I spoke to at the Makati head office. 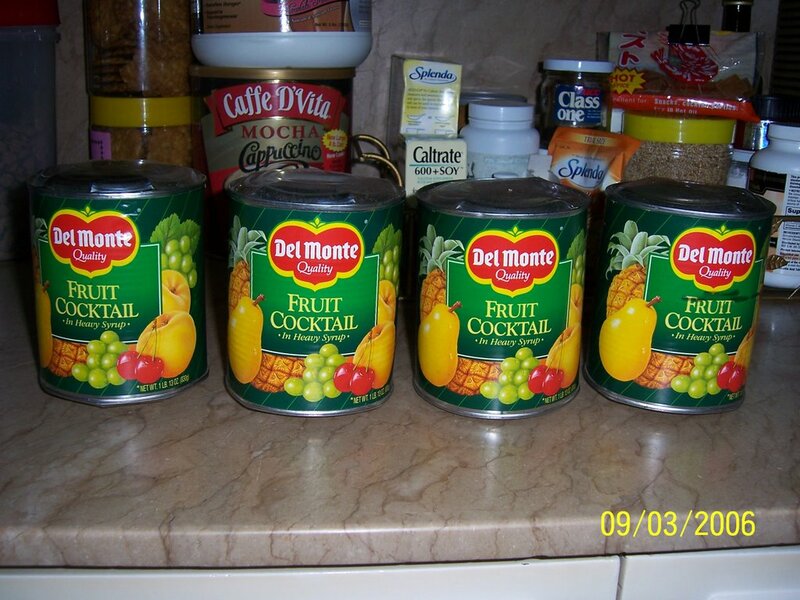 Just a few minutes ago, the helper came in the office and informed me and my mom that 4 out of the 5 cans of the Del Monte Fruit Cocktail that we were gifted with had both its ends pop out. 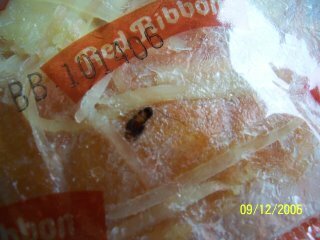 I asked her to check the expiry date and she told us that it was going to expire on March 16, 2007. That's about 6 months from now! I was shocked to see the cans, when she presented them to me. After that conversation, I immediately called Del Monte Philippines - and I spoke to a Miss Je Zaguirre - she was very polite and eager to help. She asked me first if the product was a 'Fiesta' fruit cokctail and when I replied 'No' She answered me in a very nice way, unfortunately as she said 'It's not a locally made product therefore as much I want to help you, I can't' But good thing - she gave me the number of another distributor - Macondre. 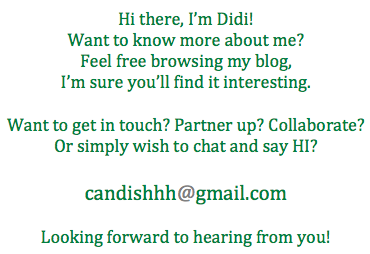 I will contact them tomorrow as it already late. 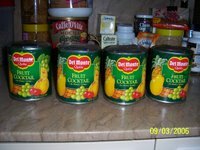 I am attaching some images of the Del Monte Fruit Cocktail cans - all 4 had both ends popping out. Well, your guess is as good as mine..